Over 400,000 new cars drove onto the streets of Beijing in 2006, bringing the city's total to more than three million, Chinese state media says. Officials expect the number of cars in the capital to continue to grow by 10% a year for the foreseeable future. But the growing number of cars has triggered problems of gridlock and rising air pollution. China is under pressure to act on air pollution ahead of the Olympics Games to be held in Beijing this summer. In recent years, the emergence of a wealthy urban middle class in China has meant a growing demand for private cars. 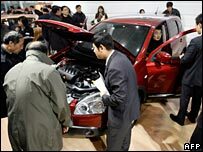 Every day in 2006, more than 1,000 cars rolled out onto the streets of Beijing, Xinhua news agency said. But this increase in cars has contributed to growing concern over the environment. A UN report released in October 2007 said that pollution in Beijing was more than three times the safe limit. China has also been warned by the International Olympic Committee (IOC) that some Olympic events might have to be cancelled if air quality is too poor. 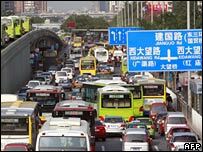 Unlike some other cities in China, Beijing authorities have said they will not introduce measures to limit the number of private cars on the road. Instead, they say they will focus on improving the capital's road networks - a move aimed at reducing gridlock on the city's streets and the smog caused by idling traffic. In the past, the authorities have experimented with car-reduction days, where residents were banned from driving cars with odd or even numbered registrations on certain days. In September last year, more than 100 cities across China held a voluntary No Car Day, but correspondents said the day had little impact in Beijing.